this is a post very close to my heart. i am an egg person and always have been, i like them prepared all the ways, on top of all the things, i will never say no to any egg ever. 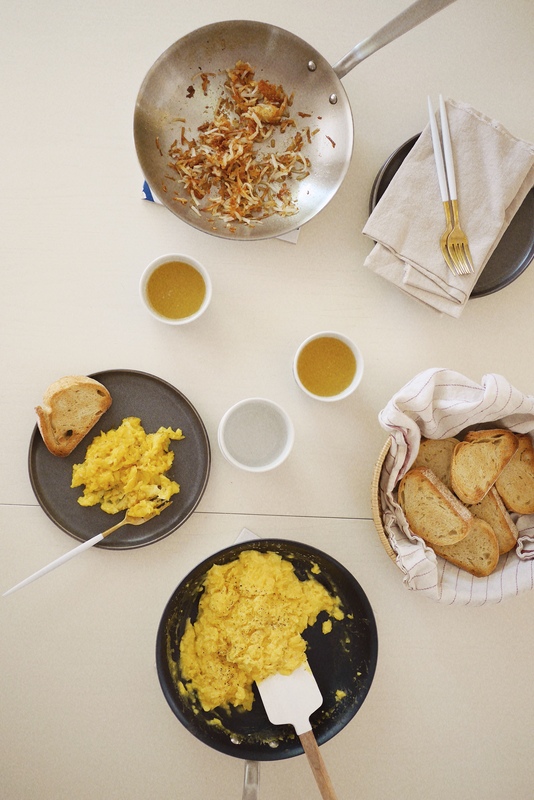 my friend shoshana is a pro and has always made my all time favorite scrambled eggs, so i asked her to share her tricks. and i am so excited to now share them with you! 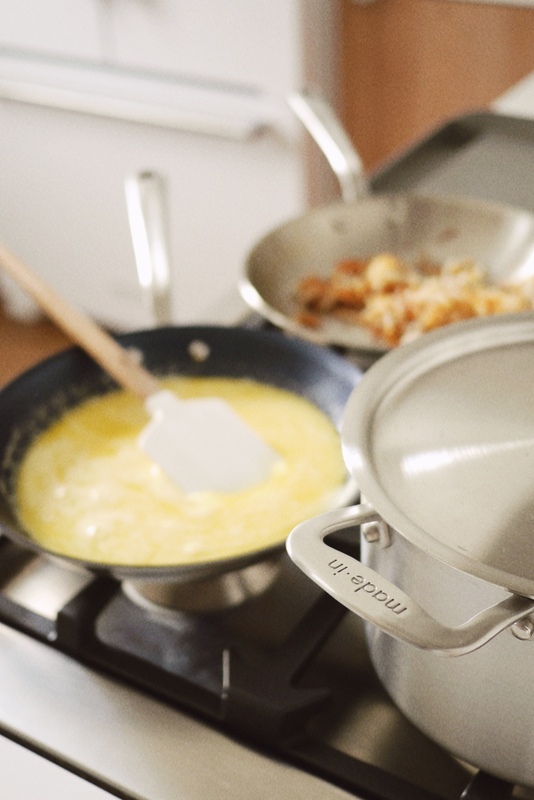 i’ve teamed up with made in cookware, if you haven’t heard of them — you should, right now! they make premium cookware that is affordable and so nice to use, and you know i’m a sucker for pretty packaging, they’ve got it. it’s the only hip line of cookware i’ve seen, so obviously i love it. sometimes you forget there are other options besides the big box and department stores for buying cookware, but made in is higher quality for a lower price than a lot of what i’ve used and owned in the past. 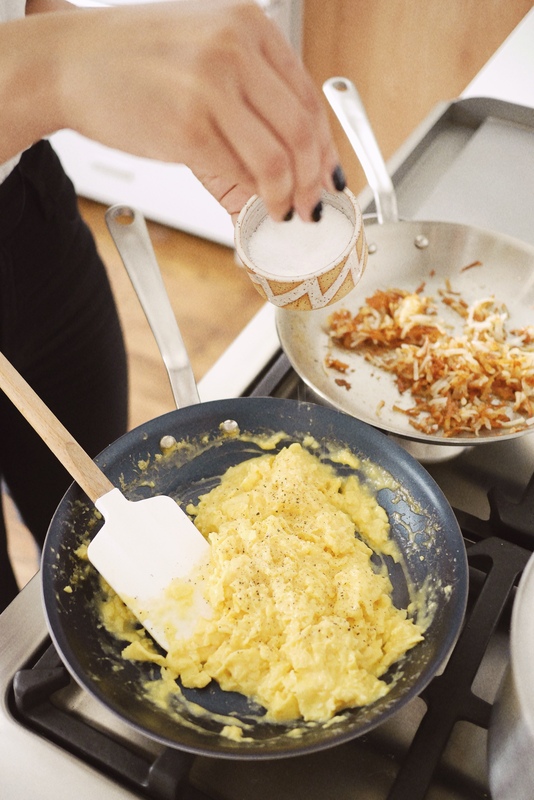 so do you love that creamy soft scrambled egg like i do? this method is a no-fail way to achieve it. it’s sooo good on top of toast. 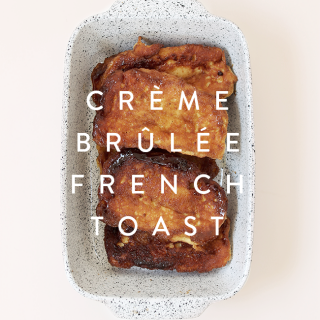 it’s also a nice change of pace from your typical holiday recipes right now, i don’t know about you, but in our family — the breakfast on christmas morning is just as important as the dinner. 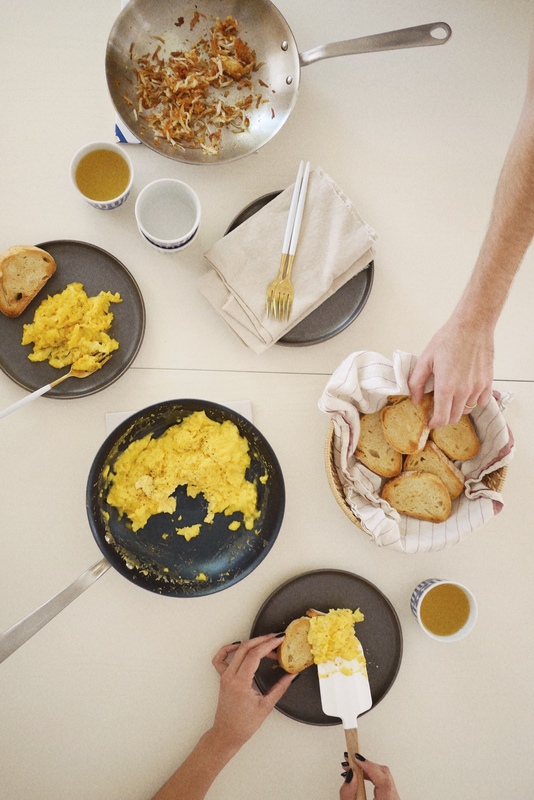 we also have a big hearty meal before doing presents, and i’m totally making these eggs for the family this year. 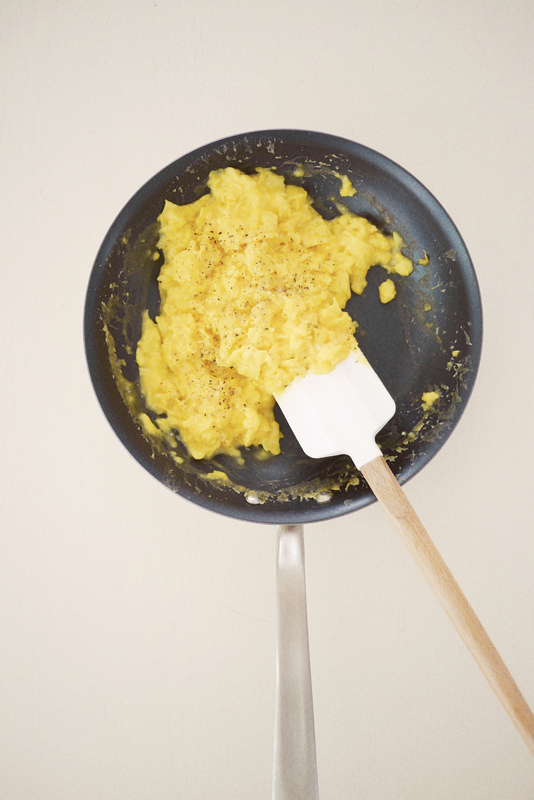 always use a nonstick pan for scrambled eggs. 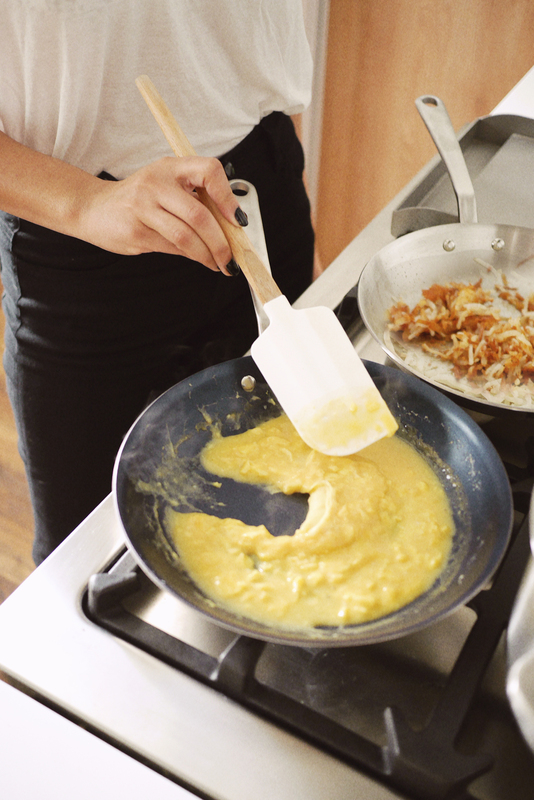 shoshana recommends actually designating one nonstick just to eggs. (i also do this!) and the made in nonstick has the cutest little touches, like on the bottom of the pan it has tips for the perfect omelette. 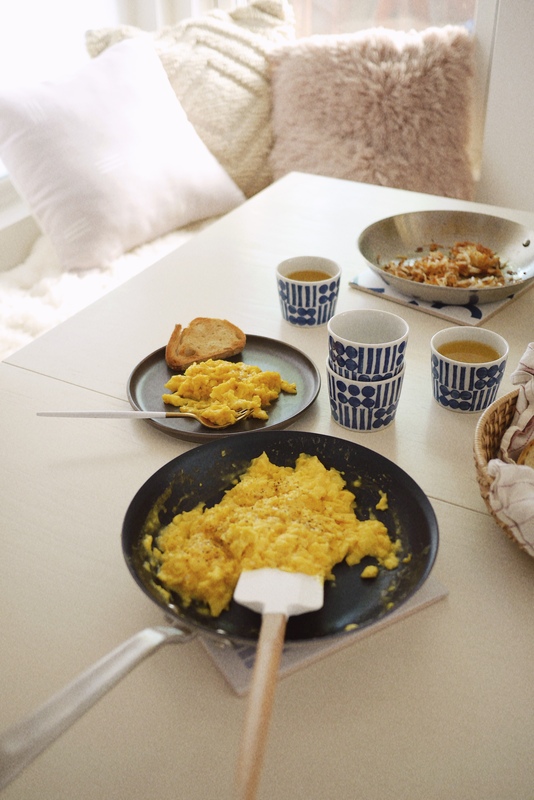 and ps, sho’s method is very similar to a french style omelette until the end. use high quality european butter for that special, rich enhanced flavor. 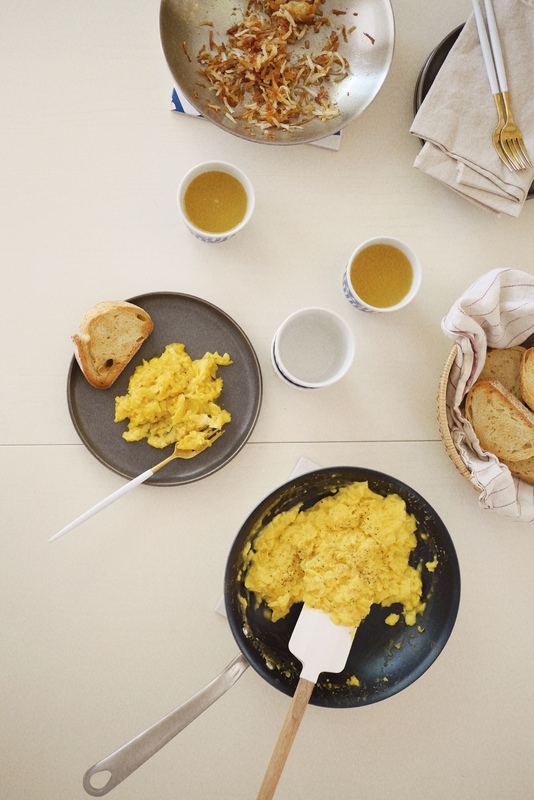 this is not a low-cal method for cooking the eggs, butter is a big component! 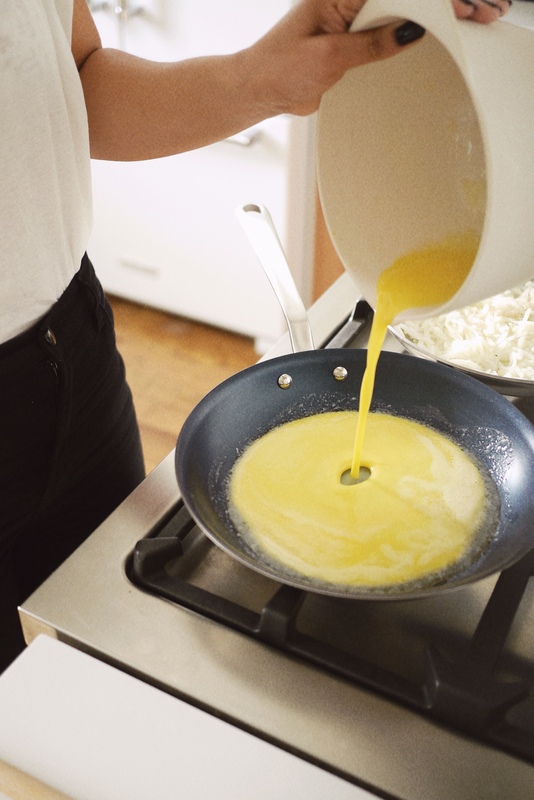 start by heating up your pan over low heat while you beat your eggs in a bowl. beat longer than you think, the objective is not to get foamy (you’re not trying to whip air into them), but rather to whisk them into a homogeneous mixture. you can test this by lifting up your whisk and seeing how it falls back into the bowl. 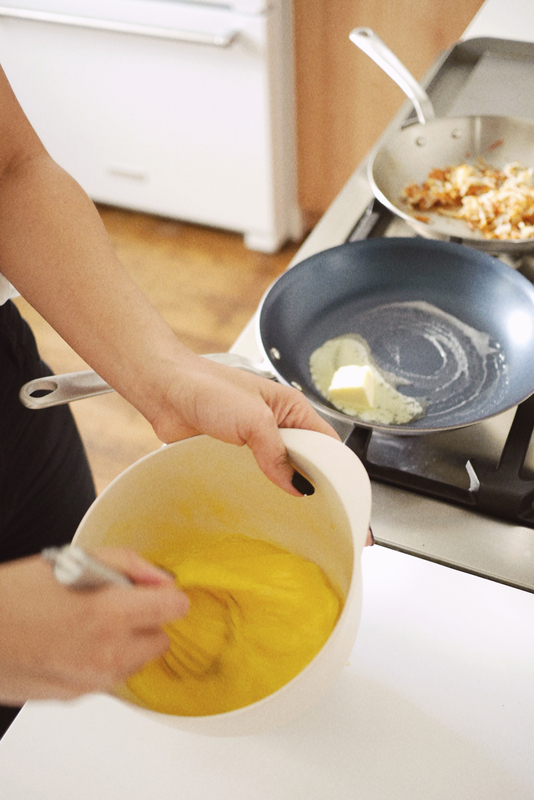 if it’s still clumping, keep whisking. 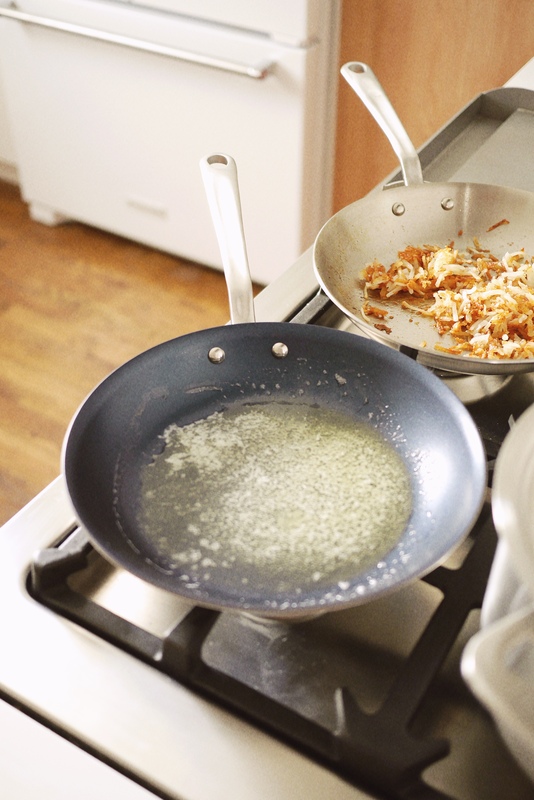 meanwhile, add the butter to the warm pan (the pan should be warm, not hot!). the butter should melt evenly over the low heat like in the photo below. you don’t want any bubbling or sizzling. the amount of butter you use is up to you, but like i said, don’t worry about using too much — butter is your friend with this recipe. we used a decent chunk! 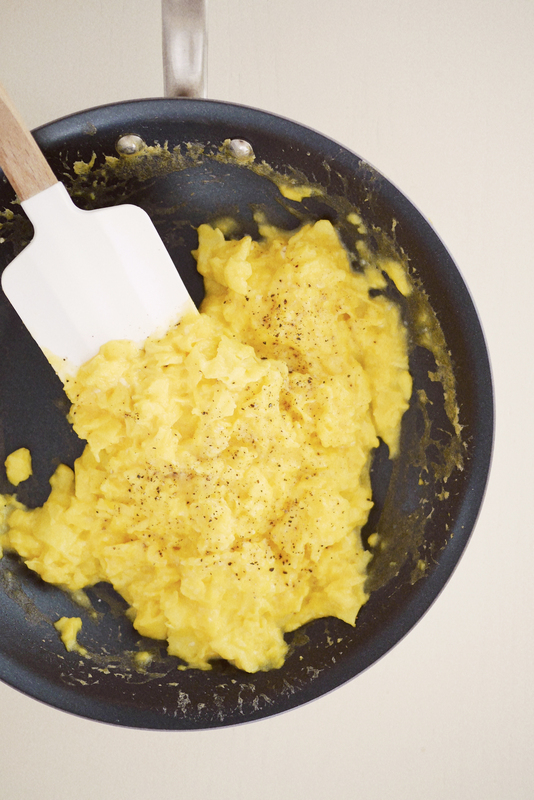 now add the eggs to your pan. this process is a low and slow one — keep the heat low and just keep slowing stirring with your spatula. over a few minutes, they’ll start to form curds. once the curds start forming, keep stirring and just break them all up, and to keep the texture even. here’s where sho adds … wait for it … more butter! add another 1/2 a tablespoon or so to add even more creaminess. 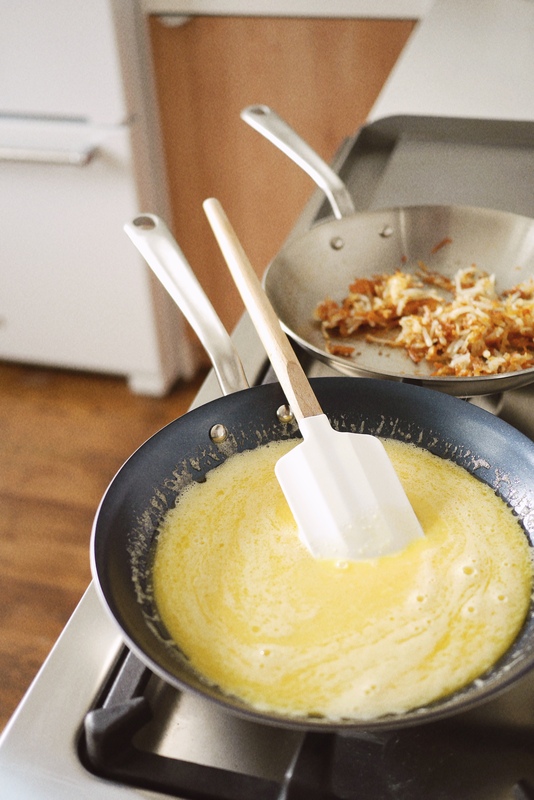 just keep stirring, and keep breaking up any large curds with your spatula. season with salt and pepper, and add any fresh chives if you want to at this point. (sho doesn’t like other herbs because she thinks it takes away from the purity of the taste) serve immediately! 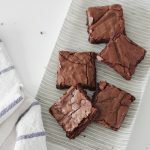 would love to know if you try this out! or if you have your own secrets. 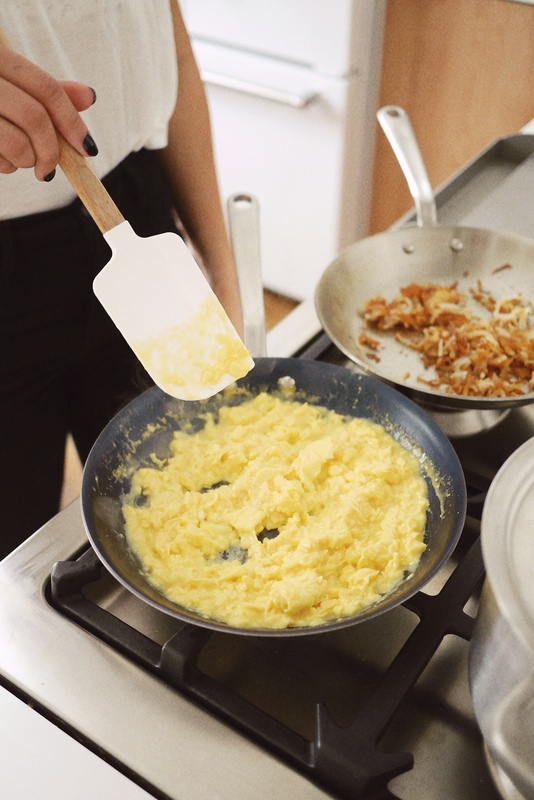 i’ve decided my new made in non stick pan will officially be my designated egg pan and i’m very excited about it. made in cookware is super affordable and would make the perfect holiday gifts for any cook in your life (or aspiring cook, because we all know how inspiring some new cookware is for getting you into the kitchen). 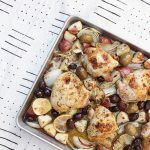 this post is in partnership with made in cookware. I’m an egg person too and I’m gonna try to make this one this weekend. It looks delicious and different then what I’m used to. Thanks for the recipe. Yep. Perfect. Slow and low has been my method but I used to turn up the heat as soon as the curds starting forming. Today I just kept it on low the whole time. wow…Thank you so much for this recipe…Egg is my all time favorite ….And I feel this is a simple and easy to prepare dish..
As a busy person this will be very useful for me and of course this is a perfect time saver..I am gonna try this for the next day itself and I hope my kids too love this.It looks really delicious..